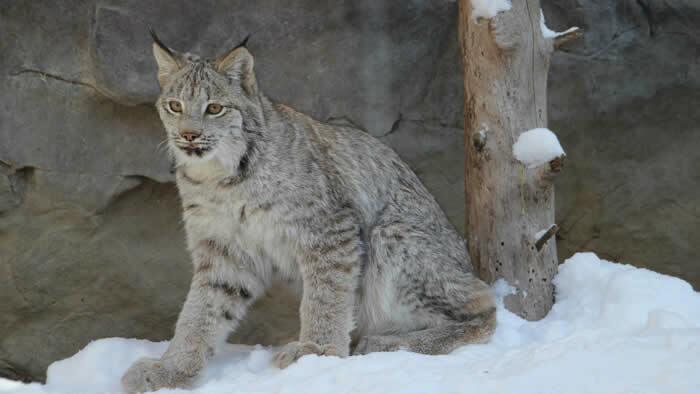 Lynx are well suited to living in snow: large furry feet serve as snowshoes, long legs help them stay above snow drifts, and extra-thick fur keeps them warm and silent. They mostly hunt snowshoe hares but will also eat birds ad small mammals. In the northern forests, where their adaptations to snow serve them well. Like other cats, they usually rest during the day, often under cover such as a fallen log or rock ledge. Minnesota used to have the most lynx in the Great Lakes. Numbers dropped to near zero in the 1980s. Only recently have we seen signs of recovery. Head & body: 30-40 in. 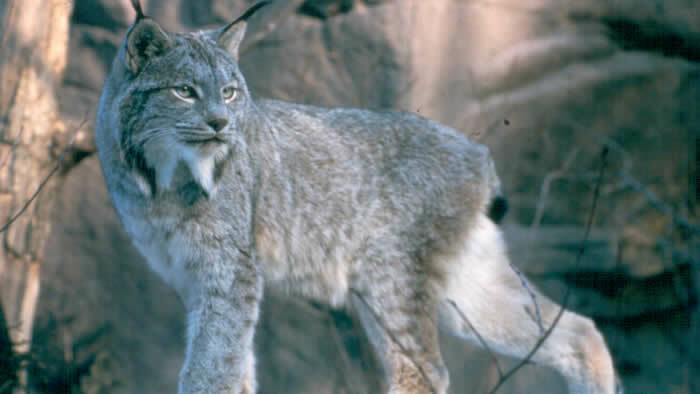 Canada lynx are larger in overall size than bobcats. They have longer ear tufts and less prominent spotting on their fur. Feet The “snowshoe” feet of the lynx are much larger than those of the bobcat. They tend to be found farther north where they can take advantage of deep snow. Tail On the lynx, the tip of the tail is all black. On the bobcat, the tail has black stripes ending in a black tip. Both lynx and bobcats are nocturnal. If you’re ever lucky enough to spot one of these cats in the wild, it is probably a lynx. Lynx are more likely to remain in an area long enough to give you a quick view, whereas bobcats tend to be more secretive. Canada lynx are not fast runners. They hunt by stalking and pouncing on their prey. For every one prey caught, 10 may escape. Lynx numbers go up and down with the population of snowshoes hares. So protecting lynx means protecting hares. Like other members of the cat family, lynx have sharp, retractable claws (they can pull them in). They use their claws for capturing prey, fighting, and climbing trees to escape large predators like wolves. Lynx communicate using sounds. They have a wide range of vocalizations from very high pitched to a very low growl. Minnesota used to have the most lynx in the Great Lakes. Numbers dropped to near zero in the 1980s. Only recently have we seen signs of recovery. Lynx follow snowshoe hares, and it is possible that as the climate warms they will move farther North, and eventually out of the state altogether. Canada lynx are typically nocturnal, solitary, and wary of people, so it is difficult to study them in the wild. Researchers from the Natural Resources Research Institute at the University of Minnesota Duluth, have been using innovative methods to track and study lynx in the Great Lakes region of Minnesota. Specifically, they have been investigating lynx distribution, habitat use, abundance, and persistence. 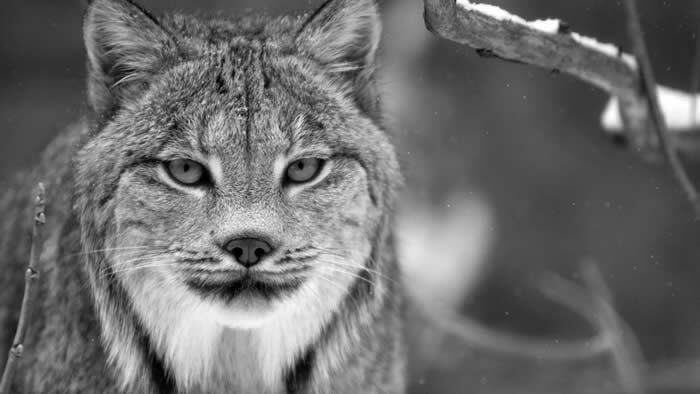 To better understand these issues, numerous lynx have been outfitted with radio telemetry and GPS collars to allow researchers to obtain important information about their behavior and activities. Funding from the Minnesota Zoo’s Ulysses S. Seal Conservation Grant Program has allowed the purchase of additional GPS collars. Minnesota Trail supervisor, Tom Ness, who has also participated in the study, championed this project.